Nobody’s differentiated themselves the way that it says — Shelvin has, in my mind. You know, I mean, that’s clear, obviously, because he’s starting and playing more minutes. But he hasn’t been in shape yet, and you know, as that happens, we’ll adjust to it. But I think, you know, again, the decision to play Raul is based on his ability to defend, by and large. Snyder on the point guard rotation after the Hawks game: I don’t think our substitution pattern’s is gonna be the be-all, tell-all for the game. Snyder on Mack’s performance against the Hawks: He didn’t shoot well, but he was getting great looks, and at some point, you know, you have to show confidence in a player. He just needs to get some consistency, and he’s capable of doing it. We just need to keep — he needs to keep demanding it of himself, and we keep demanding it of him…To me, the defensive stuff for him, if his focus stays there, his offense will just continue to flow. We’re getting double-digit leads early in the game. You know, we’re just, it’s that, it’s just a little stagnant later on. We have a lapse, for whatever reason. Turnovers happen, we’re not making shots or whatever, etc., etc., and now all of a sudden our lead’s gone, and we’re in a dogfight, momentum’s shifted, and it’s a different game. Four. Trey Lyles bench celebration of the week. He’s clearly hit the rookie wall. Derrick Favors, asked if he feels added pressure as a leader of the team to get the team a playoff spot: No pressure…Nah, I don’t feel any pressure. You know, I put the work in. I put the time in, and it’s all about going out there on the court and just doing it. So, I don’t feel pressure. Gordon Hayward, asked how important making the playoffs is to him: I think it’s very important. I mean, that’s what we talked about. We’ve been talking about this the whole year. And I think it’s just time to not talk and just, we gotta go out and play. We gotta make it happen, or else it won’t. Rodney Hood, asked how important making the playoffs is to him: I mean, it’s important. You know, we taking it game by game, and we know we got a small window right now. You know, we gotta put some wins together. We just need to win. You know, I think that’s the biggest thing. Get the team morale up a little bit. You know, need to win. Quin Snyder, asked how important making the playoffs is to him: Well, you know, I think it’s manifold. I mean, I think [with our injuries], you try to be optimistic and you work and you wanna win, but there’s also some realism involved when you take those kind of injuries…It’s not the end of the world for us to really compete and even not make it. Is the year gonna be a failure if we don’t make the playoffs? Of course not….You’re gonna have a hard time seeing a team without four of its top six players at a certain point succeed on a high level. So I mean, in that sense, I feel like this season has been, you know, a great success as far as what we’ve been able to accomplish as a group, and growth, and guys maturing as players, and you know, through that, we find ourselves in a position where we’re in a playoff race, although, you know, we’re not currently there. You know, we’re a few games back, and you know, what the heck, let’s, you know, let’s play the way we played last year, and just compete with, you know, something else at stake. Six. Derrick Favors, asked why the defense hasn’t been as good as it has been: Teams just hitting tough shots. You know, we still doing the same things. We changed some stuff up a little bit, but you know, it’s not like [teams are] just getting easy, open shots. You know, they hitting tough shots. They moving the ball, you know, five, six, seven times. It’s nothing easy. So, we gotta ju–they just hitting tough shots, basically. Quin Snyder, asked why the defense hasn’t been as good as it has been: [Turnovers are] part of it…You know, we haven’t had a full roster with, you know, Derrick, Rud–the backbone of our defense was, you know, Derrick, Rudy [Gobert], and Dante [Exum]. And we’ve been playing throughout the year with Derrick and Rudy being hurt. They’re back now, and I kinda haven’t felt the same way. You want to see your defense take some steps this last 20 games. I think we’re trending that way. I really do. I, you know, I’ve been pretty forthright about that, when I thought we weren’t very good in December. I feel like we’re getting better. Seven. Quin Snyder, asked how much he involves Dante Exum in practice: It’s actually something, you know, I wish I maybe devoted more, you know, thought — you know, you think about, you try to think about your players and how you can help all of them, and your focus is obviously on the guys that are playing. But that, it’s important for us to think about him. The guy that I’m thinking about all the time is Alec Burks. And you know, Alec, recently, you know, he’s, we’re hoping he can get back. We’re being really smart about making sure he’s ready, not just his ankle being healed, which it is, but you know, his conditioning, his, you know, his body being balanced and everything. So, we’re assured that, you know, something else may not occur as a result of coming back too soon. But you know, Alec, for instance, I’ll call on him in a film session. I’ll do the same with Dante. We’ll talk about the game a little bit. I called Dante in — he was with us in Golden State — and talked to him about the game before we played the other night. Just kind of wanted to throw some things at him that he could look at. I’ve done the same thing with Alec. Alec, even last year, was a guy that I tried to really coach while he was out. And he’s one that — it’s interesting, because, you know, Dante won’t be back this year. In Alec’s case, you can just see him chomping at the bit at times, and you try to maximize everything you can do. And he’s such a good kid and so hungry to play that sometimes I feel like even if he’s not ready physically, we can keep, you know, kinda satisfy some of that competitiveness by challenging him to continue to be involved in the game. The other thing that happens is you’ll see a lot of times, they’ll sit behind the bench at games, and usually it’s Lamar Skeeter*, one of our coaches, that has a pretty good dialogue with Dante throughout the course of the game. Johnnie Bryant, you know, with Alec a lot too. Not so much during the game now ’cause Johnnie’s sitting next to me, but during the course of that, you know — so those guys get a lotta interaction and a lotta questions, and we try to keep them connected. 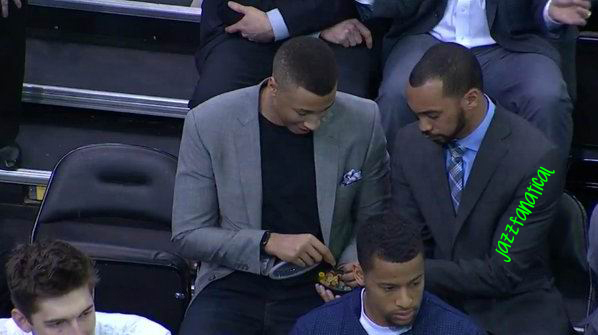 * You may know Lamar Skeeter as the guy who eats gummy bears with Exum on the bench. Sometimes, playing is the only thing that you can do to develop. I mean, people look at player development and you think work on and off the court, film, etc., but opportunity is a catalyst for that too. So, we’ve had some of that. And not playing can be a catalyst for development. I mean, just to be confronted with the realism about where you are as a player can provide, you know, motivation. So, you know, we’ve played the guys that have been healthy, really, is the primary thing for us, and we’ll keep doing that, and try to use guys in the right way to help us win ball games, and indirectly, that helps them get better too, I think. Nine. So weird to see him in street clothes. ** Quin Snyder on consistency: You kind of plug one hole, and the other hole. ** Shelvin Mack on his missed shots against Atlanta: Yeah, they felt good. I think probably, like, three or four of them just go in and out. You know, just one of those days. ** Matt Harpring to Craig Bolerjack: Were you always not, I mean, were you short at one point? Because I was average. S–average. Because about fourth or fifth grade, I was average. Boler: And then it all changed. ** Harpring on Steph Curry: He goes right into the referee. You do that, obviously, technical foul. ** Harpring on Leandro Barbosa drive: He gets right down the middle here, and then once it’s in there, it’s just too hard. ** Joe Ingles on his inflamed knuckle: I wear, like, a splint on it just to keep it not as inflamed or whatever. ** Ron Boone on Gordon Hayward: Just didn’t have enough legs to get up and put it in. So, we are still fighting for a playoff spot. I am happy of this and I am confident we can reach our goal. Go Utah!